Filmmaker Alex Winter explores the effects of music-downloading on the kids who accomplished it, the bands and businesses affected by it, and its impact on the world. Download Downloaded in Digital HD from the iTunes store. Downloaded images are © VH1. All Rights Reserved. Is sharing things with your friends legal? Is it okay to let a friend borrow a book, a movie or a CD of yours? Normally you answer yes, it's okay to let someone borrow one of those things. But in the digital age, can you legally share those same things? That is a question, that while has been answered in the courts, is still relevant today as it was during the Napster era. Downloaded is a documentary that looks at the history of Napster, from the humble beginnings, to getting capital funding, and to its final downfall. 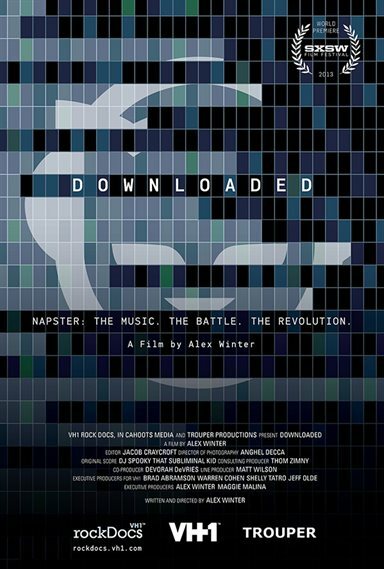 Conceived and directed by Alex Winter (Bill and Ted's Excellent Adventure), this VH1 Rock Doc traces the evolution of Napster; not just from their side, but from all sides. Alex Winter originally conceived the project as a movie, and as the research progressed, it turned into a narrative documentary. He was able to get tremendous access to the founders of Napster, including Shawn Fanning and Sean Parker. For the first time you can hear directly from them how they were feeling during the various stages of the company's history. But Alex doesn't just tell the story from their point of view. Alex reached out and got various other music industry executives to appear, and mixed their current day interviews with news outlet footage taken during the Napster saga. This mix, in a narrative format, creates an exceptionally well done and very informative story about Napster – the company, the software, the people, and most importantly, the culture change that was occurring right at the same time. While it runs almost two hours without commercials, it is very engaging and you won't be bored. Additionally there is something else to the documentary that I noticed, and that is it seems that every interview was done off-center, and this was done for artistic purposes according to the director. "It is a way to keep the audience engaged and awake." I had the opportunity to speak with Alex before SXSW, and I asked him what he thinks about the entities that followed Napster, such as Grokster, LimeWire, Kazaa, and most recently MegaUpload. "I get asked that a lot. I never really looked at Napster, and I still don't as a piracy service. Limewire, Kazaa and the others that came up afterwards- didn't have any interest in cutting deals [getting licenses] with the record industry. Napster was the ones that created the base code. But Napster‘s business model was incumbent on getting deals with the record industry. They did not stand to succeed or make a penny if they couldn't obtain licenses from the record industry..and in the end they didn't, and went bankrupt." Which is an interesting point that is only briefly covered in the movie (because it happens after the fall of Napster), and that is as Alex describes it, "…the paradigm shift from the old business models to the new business models." I asked him if he thinks the record companies missed a huge opportunity by not getting on board prior to the success of iTunes. "The record industry was incredibly slow in joining the party; or finding business models that would include digital distribution. But out of fairness to them, existing companies usually never adopt new technologies. The Chicago Ice Company, who delivered ice, didn't adopt to the refrigerator, and went under…I don't think they were evil…it was understandable to be a very volatile [time]." So did Alex learn anything new while making the film? "Absolutely…there is so much I don't know where to begin. It was extremely illuminating…I knew that the record industry was really upset about [Napster] but it's just gotten worse and worse. And not better." Downloaded will help you, the viewer see that, and more – in an engaging documentary that chronicles the rise and fall of both the most-beloved and most-reviled software ever created.